My god, we’ve certainly had our fill of articles on the Sony film and they all have in common their radical opinions. Even Barack Obama chimed in with a badly timed and poorly thought-out statement that the hacking would not go unpunished. Early pundits pointed their well-sharpened fingers at North Korea, although that appears to be increasingly suspect. I’ve seen nothing on the ‘why?’ behind all this uproar. ‘Around here’ was no doubt meant as a reference to corporate culture, but the question is as broad as the Mississippi and worldwide. Why indeed? In the Sony matter, it strikes me that writing, producing and airing a film that makes comedy of assassinating a sitting Head of State is bad taste and bad judgment at its extreme. A comedy? Yeah, what a laugh. No matter that Kim Jong-un is not a favorite of the West and by asking why all the way to the beginning of the thread, we might question our Western reaction if such a movie were made suggesting the assassination of David Cameron, Stephen Harper or Barack Obama. The Interview should never have been made—not because of censorship or objection by our government, but with a more common-sense decision by Sony to never have begun the project. 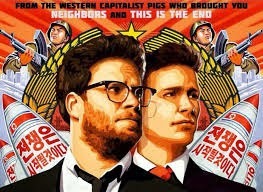 The Interview is both in bad taste and an incitement to killing Kim Jong-un for reasons that are beyond me. In this particular case, Japan is currently up to its knees in apology for war crimes committed against Korea (then a unified country) during WWII. The Japanese national conscience, filtering down (or up) to Kazuo Hirai, the Sony CEO, should have lit all kinds of emergency ‘why?’ lights. Now it seems profit is a motive as well, as online sales and rentals generated roughly $15 million in during the film’s first four days. Such hoopla pushed ticket sales off the map and Sony, no doubt with this in mind, caved in to second thoughts about keeping it out of movie-houses and offline. Which still fails to answer the question. Why do we let ignorance, a general decline in civility and our current national favor for machismo over considered judgment create an international crisis that should never have been allowed to happen? Ask yourself why and then take it all the way to the beginning of the thread.